Hackers are getting smarter as the technology changes. The good thing is that the technology to stop them is also getting smarter. The best way to stop a ransomware attack is to prepare for the worst. Install a good strategy that will keep your company safe no matter what. In a previous post we talked about How to Protect Your Business From Ransomware. In this post, we wanted to elaborate a little more on the subject, especially how to react to such attacks. To find out so more information or facts, you can visit Microsoft’s Protection Center for FAQ about Ransomware. Hackers are starting to realize that people will pay the ransom if it costs less than it would to fix it. They find that it is easier to collect lots of small payments, than to not collect anything at all. This is where you have to train your team to not fall victim to the “easier choice”. You are more likely to get hit again if you pay the ransom. Hackers already know you are willing to pay. You don’t want to repaint yourself as a target. You should already have a backup system in place in case of any emergency. The big thing here is to store the backup in a safe place. The worst thing that could happen would be for hackers to get access to your data AND your backup data. Create many backups if you have to. There are loads of inexpensive cloud remote backup services online that you can use. 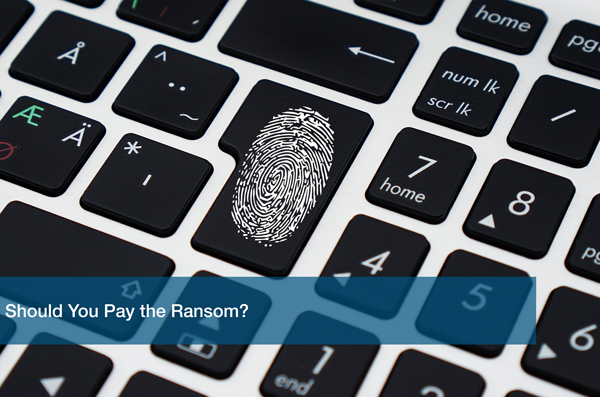 It might be cheaper to pay for a backup service than to pay a ransom. Most hackers threaten to erase your data if you don’t pay. This makes sure that you are still safe even if they act on their threat. Hackers can attack anyone in your company. Top executives should receive the same training as all the other employees. Company Wide training sessions are a great way to get everyone on the right track. Every employee should know how to handle any and all attacks to ensure that the proper steps are taken to protect the company. Know how to recognize such attacks and then follow the proper guidelines. Notify your IT department so they are aware of the attack and can follow protocol to protect your data. Anyone can be hit at any time. It’s best to be prepared for the worst. Anti-malware is there for a reason: to protect your computer so such attacks never happen in the first place. As new attacks come out, new updates are released to deal with them. There’s no point in having antivirus software if it is not kept up. The great thing is that they automatically check for updates and will notify you if a new one comes up. All you have to do is push it through so your system is always protected. Having frequent security meetings is also a great way to make sure that all employees have the proper knowledge to deal with those situations. Include a section in orientation to discuss security procedures so new employees are also trained properly. A strong team is essential for keeping your company safe. Here at ITC we always put your people first. We protect your business from all attacks with our security and backup managed services. We give you peace of mind by taking care of all your technology needs so you can focus on your business. You are always in goods hands with ITC as your complete IT partner. Schedule a Free IT Analysis today to discover the perfect IT strategy for your business.